Israel. From the Biblical Archaeology Society. My recent publication on David and the Psalms in the Book of Mormon ("Too Little or Too Much Like the Bible?" at The Interpreter: A Journal of Mormon Scripture), responded to some recent critical claims against the Book of Mormon by showing, among other things, that the Book of Mormon makes greater and more sophisticated use of the Psalms than one critical scholar recognized. However, one of the more interesting uses of the Psalms was not mentioned. Psalm 67:1 is especially interesting because it is related to the oldest Hebrew inscriptions known, inscriptions that probably date to Lehi's day. Interestingly, it was engraved on silver metal, two very small pieces, not a large book, but still legitimate inscriptions on ancient precious metal apparently serving as amulets. It was discovered near Jerusalem at Ketef Hinnon. The story and significance of the two engravings are discussed by one of the scholars involved in bringing that discovery to light, the Israeli archaeologist Gabriel Barkay in "The Riches of Ketef Hinnom," Biblical Archaeology Review, 35:4 (July/August September/October 2009). The Lord make his face to shine upon you, and be gracious to you. The amulets can be securely dated on a combination of three grounds. Paleographically they can be dated by the shape and form of the letters to the late seventh century B.C.E., before the Babylonian conquest. Stratigraphically the first amulet was found only about 7 centimeters (less than 3 in.) above the repository floor, which testifies to its relative antiquity within the repository assemblages, which rose to about 2 feet total. The second plaque was found in the innermost part of the repository, far from the entrance, among the earliest deposits. Finally, the date suggested paleographically corresponds to the chronological horizon of the late Iron Age pottery found in the repository. The silver plaques thus come from the late seventh century B.C.E., or the time of the prophet Jeremiah and King Josiah. The implications of this dating are startling. First of all, it means that these texts on our silver plaques are the oldest composition of words similar to Biblical verses in existence. 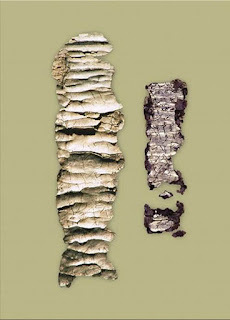 The earliest Biblical texts among the Dead Sea Scrolls date to about 250 B.C.E. at the earliest. That means that our texts are older than the next oldest Biblical texts by nearly 400 years. Moreover, these inscriptions are the only texts of the First Temple period with clear similarities to Biblical verses. There is a major scholarly disagreement as to the date of the Priestly Code. Some scholars contend it predates the Babylonian conquest. Others say it is later. Our two texts seem to support those who contend that the Priestly Code was already in existence, at least in rudimentary form, in the First Temple period. The priestly blessing seems to have been widely used during the First Temple period. Its influence can be traced both in the Bible itself (see Psalm 67:1, for example) and in early Hebrew epigraphy. In addition to our references, an inscription painted on a large pithos at Kuntillet ‘Ajrud in the Sinai Peninsula contains the Hebrew words YBRK wYŠ MRK wYHY ‘M ’DNY, which can be translated as “[may God] bless you and keep you and be with my Lord.” This, too, dates to the First Temple period. The Ketef Hinnom excavations have made an enormous contribution, not only to our understanding of life in Jerusalem more than 2,500 years ago, but also to our understanding of the development of the text of the Hebrew Bible. Psalm 67:1, as noted above, is strongly related to the inscriptions. The KJV is: "God be merciful unto us, and bless us; and cause his face to shine upon us; Selah." Another related and important part of the ancient temple rites was the idea that when the Lord appeared, He would “lift up” the light of His countenance and His face would “shine” upon the people. This was part of the priestly blessing (Numbers 6:24–26) and is mentioned repeatedly in the Psalms [the footnote here cites Psalm 67:1]. The sight of the shining face of the Lord was supposed to effect a transfiguration in those who saw it so that their faces would also shine, as was the case with Moses on Mount Sinai (Exodus 34:29–35). These findings demonstrate that Book of Mormon authors had access to at least some of the Psalms, either from the plates of brass or from memory. So the Book of Mormon appropriately integrates language from a text in Psalm 67:1 and Numbers 6:24-26, once thought to be a creation from a late Priestly tradition that would not be written until long after Lehi and Nephi left Jerusalem, but now provided with surprising archaeological evidence that those words were known and sacred to the Israelites in Lehi's day. Those words were important enough to be inscribed on thin silver plaques or plates, but rolled up and centuries later unrolled and interpreted in our day. Writing and preserving scriptures on metal plates anciently was unknown and is a ridiculous concept (now it's much trendier to say that this would have been obvious to Joseph Smith since everyone knows this). The Book of Mormon cannot be authentic in light of the Documentary Hypothesis because it relies on some material from the Priestly source that was not in existence in Lehi's day. The Book of Mormon cannot be from authentic ancient Israelites because it does not use the Psalms heavily like some other biblical writers.